Thanks for taking time to donate to the kids fishing foundation. The kids fishing foundation appreciates your support. Below you will find all the information needed to help support the kids fishing foundation, Thanks. You can donate without having a paypal account. Just fill out the information form for your credit card information. All Donations Are Tax Deductible - We are a 501c3 non-profit organization, all donations are tax deductible. If you donate through paypal, just add a note or email us with the information and we will add it to the memoriam page. If you're sending in a check, just put a note in with it and we will add it to the in memoriam page. Your information is secure with us, we do not share your information with anyone. A receipt will be e-mailed to you as an attachment, so you can save it in your files. Donations by mail will have a receipt sent to them. Volunteer, would you like to help take a kid fishing by volunteering your time or equipment. Please look through our event list and e-mail us with an event number and we will give you all the details. Suppliers and manufacturers, we have a few different ways you can support the Kids Fishing Foundation. Please read the details below. Products. Suppliers and Manufacturers who wish to donate fishing supplies or products can do so by sending them to. 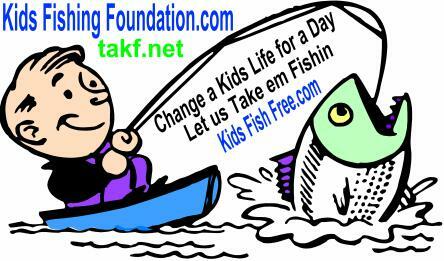 Kids Fishing Foundation, 31258 600th Street, Millville, MN, 55957. Please contact us via e-mail to let us know what products you are donating, before shipping them out. Your product donations are important to us, but we don't have a need for all products. Please include an invoice or a spread sheet of the value of the products, so we can supply a donation receipt to your business. Please include your business information and contact information. A donation receipt will be e-mailed to you as an attachment, so you can save it in your files. A second receipt will be mailed out at the end of the year for tax purposes. Host an event. Suppliers or manufacturers that would like to host one of our events, can look through our event list, choose an event you're interested in and can contact us at support@takf.net we will send you the details. What do suppliers and manufacturers get for their donation. Besides a tax deductible donation, all suppliers will be added to our sponsors page with a link to your site. On top of that, we update our homepage and place sponsor banners and images at the top and bottom of the page, so you get better exposure. Plus we write an article, posted online, showing your generosity for your donation and support of kids fishing. Things we need. We are interested in all fishing equipment, tackle, boats and vehicles. Our fishing program runs throughout most of the year, it includes both ice fishing and summer fishing. Please contact us via e-mail to let us know what products you are donating, before shipping them out.